Relax and unwind. The Safavieh Patio Collection Newbury Brown Wicker Stackable Outdoor Chairs are an update on classic wicker with new transitional style. Crafted with an aluminum frame in a tiger stripe pattern, it brings a bit of modern magic to warm summer nights. 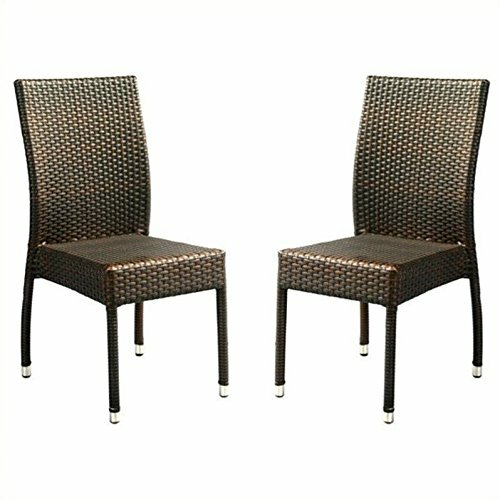 No assembly required, these chairs measure 19 Inch wide by 17.5 Inch deep by 35 Inch tall. View More In Stacking Chairs. If you have any questions about this product by Safavieh, contact us by completing and submitting the form below. If you are looking for a specif part number, please include it with your message.